Heat oil in medium skillet on high heat. Add rice and garlic to the pan and saute for 2 minutes to toast rice. Add water, broth, and salt to the pan and bring to boil. Cover, reduce heat, and simmer for 15 minutes, or until rice is tender. Remove from heat and let stand for 5 minutes. Stir in green onions, pine nuts, Parmesan, basil, thyme, pepper and Cilantro. Fluff and serve! This is a fantastic side dish...full of flavor and vibrant colors! I love this indian rice very much!! My husband loved this, although...after he ate it he questioned the nuts....he is allergic to conifers and pine trees are a type of conifer...so we'll see if he breaks out! I had no clue he was allergic to pines! I think everyday he comes home allergic to something else...My daughter loves rice, but wouldn't touch this because she doesn't like "stuff" in her rice. I thought it was just okay. I'll probably make it again, but with out the pine nuts. Served this last night to friends with chicken divan and got rave reviews - loved it. 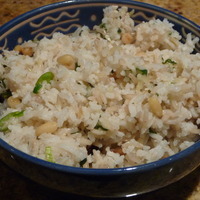 I liked this rice, i tried something like this but without the nuts. Very good to eat! I made this a couple times and it was a big hit. I used a veg broth which colored the rice a little too yellow. I recommend lighter on the broth, heavier on the water. The directions and proportions seem to be perfect, but watch the rice cook carefully so it doesn't stick to the pan. [8/2/10, second edit] Made this a couple more times and suggest the following modification: use 1.5c water + 0.5c stock (instead of even split). 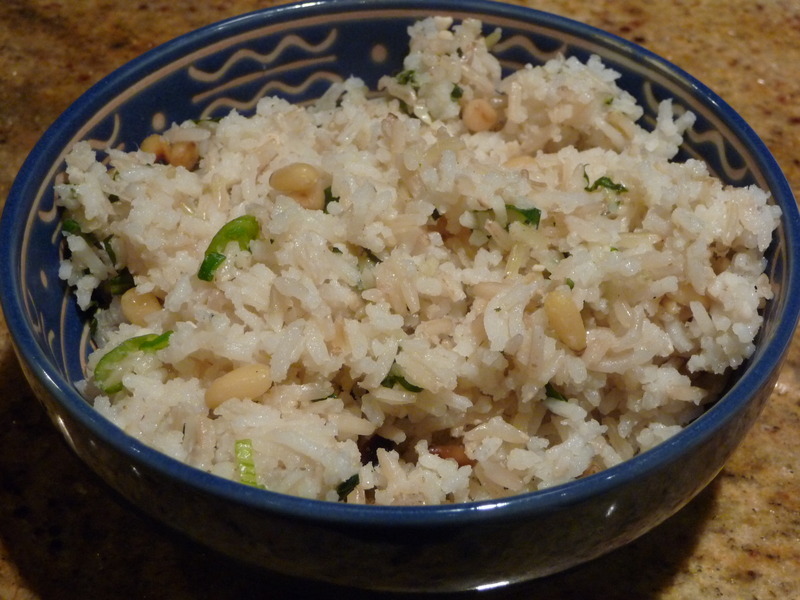 It also works great with Jasmine rice, and I kicked it up a notch on the garlic. Watch out for pine nut prices -- my grocery store sells them for $25/lb -- yikes! I made this a couple times and it was a big hit. I used a veg broth which colored the rice a little too yellow. I recommend lighter on the broth, heavier on the water. The directions and proportions seem to be perfect, but watch the rice cook carefully so it doesn't stick to the pan. [8/2/10, second edit] Made this a couple more times and suggest the following modification: use 1.5c water + 0.5c stock (instead of even split). It also works great with Jasmine rice, and I kicked it up a notch on the garlic. Watch out for pine nut prices -- my grocery store sells them for $25/lb -- yikes!